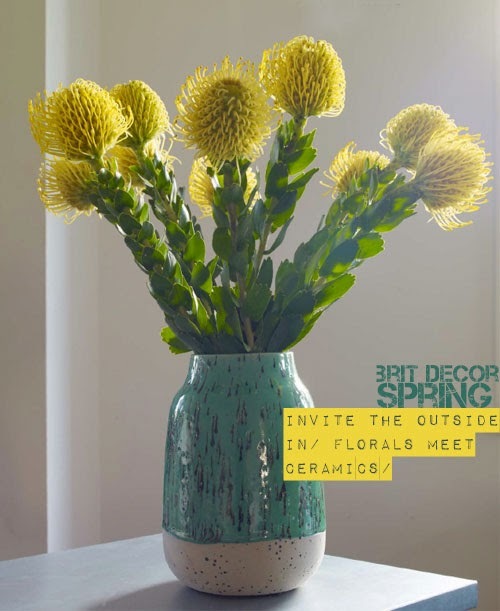 Brit Decor : Home Page: Brit Decor: Bring on the Spring! There's change in the air...here in the UK we are moving towards Spring with open arms and turning our backs on Winter, light is pushing away dark and it's all about new growth and rejuvenation. Just as much as I look to nature for inspiration; from the delicate minuscule whites of budding hawthorn twigs, to the classic sunshine yellows of Daffodils, or a subtle sprinkling of Snowdrops on a grass verge, I also seek out new inspiration from the latest homeware collections. This might simply be for new finds to share with you, or a little treat accessory, or two, as a means of breathing new life into my own home. 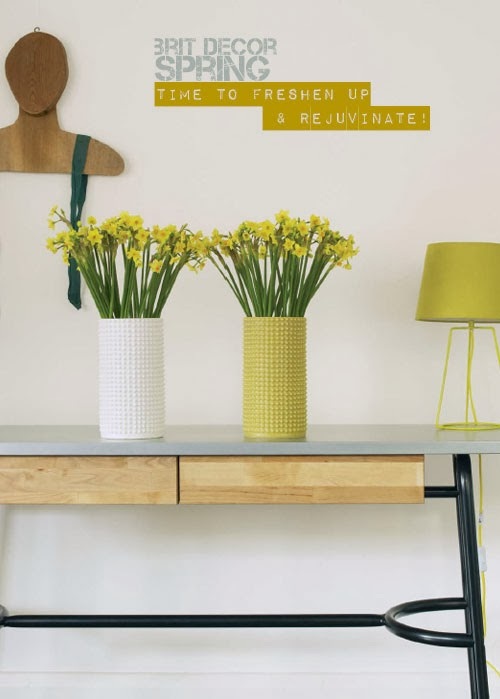 Either way, today I have immersed myself in the latest Spring collection from my old favourite, Habitat. 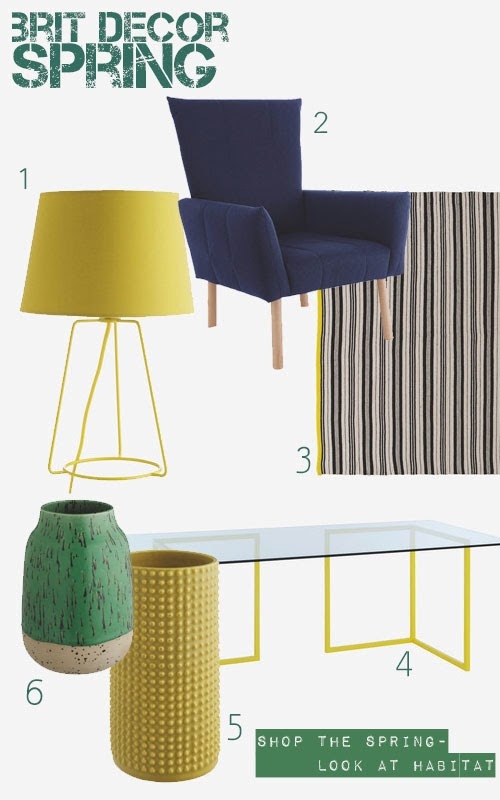 I am all for embracing simplicity in this often complicated world, and that is just what's on offer here; Clean lines with a subtle palette of Spring greens and mustard yellows, such as the Lula yellow metal table lamp (no.1) with some gorgeous dipped-effect ceramics like the Balto Safron (no.5) and Maury large green spotted (no.6) vases. 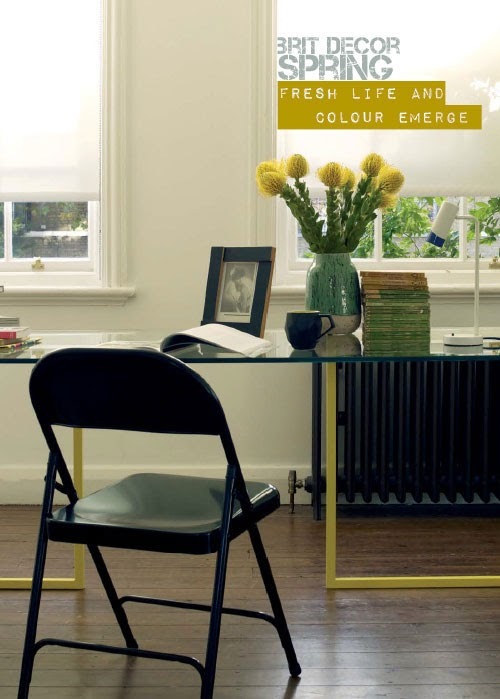 Not forgetting the welcome addition of some bold and exciting textiles - I love the Codi black and white striped rug (no.3) with its striking contrast yellow detailing, which would look great sitting underneath the sleek Nic glass and yellow metal trestle desk (no.4), and by the way, glass desks are a genius solution for smaller rooms, as they create the illusion of taking up less space! Finally, we all know the importance of having that little spot where we can put our feet up and enjoy a good book, right? 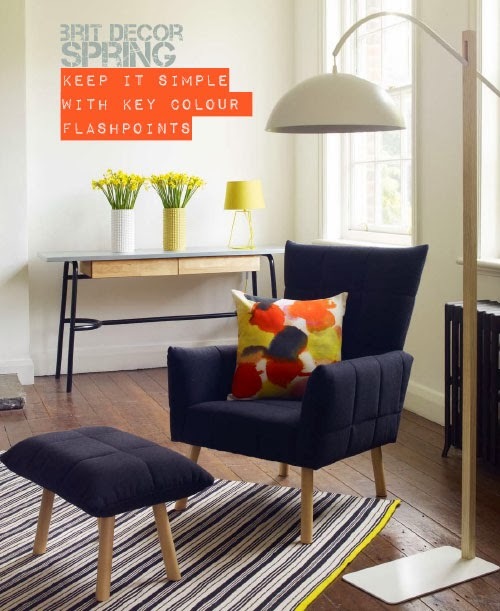 I particularly like the Marni armchair in navy blue as it adds depth and makes a stunning contrast when partnered with the mustard yellows in this collection. Wherever you are and whatever new Season you are making the transition into, embrace the change and usher in new ideas!